Are you ready to convince the interviewer that you are the best person for that job? Then, follow these tips and keep in mind that the interview is not a challenge but a way to demonstrate your value! 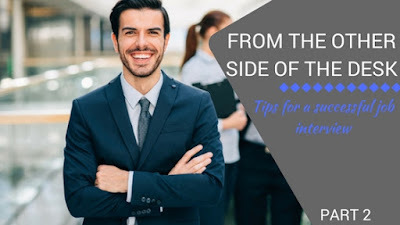 In this second part, we we will give you tips on how to behave and what to do on the day of the interview, as well as hints about what to avoid. Part 1 focuses on what employers want and how you can best prepare for your interview. 1. Dress appropriately: the way you dress is a signal of yourself and of your competence… first impression matters! Dress appropriately to the organization in question. 3. Now it’s the time to sell yourself! A good way to express your ideas in a clear and coherent way is the STAR technique: it will allow you to find evidence of what you’ve done that will meet your employer’s needs. The Situation: which was the setting? - The Task: what did you have to do? - The Action you took: how did you behave? Which was the action you took that lead to an excellent outcome? - The Result: which was the positive outcome of the situation, thanks to what you did? "...find evidence of what you’ve done that will meet your employer’s needs." · What would a typical day be like? · What will be the challenges in the developments of this position in the future? · What’s the next step in the procedure? · What are the qualities you are looking for in this position? First impression and first contacts are very important - be polite to everyone you meet! Be enthusiastic and positive - don’t complain about the bad weather, the horrible ride an don’t denigrate anyone. 5. When asked: “Did you apply to other jobs to other companies?” reply with a company that is in the same sector, and choose the best one. Follow up after the interview - send a thank you email right after the interview or the day after. And to conclude, here is a list of what you should avoid!